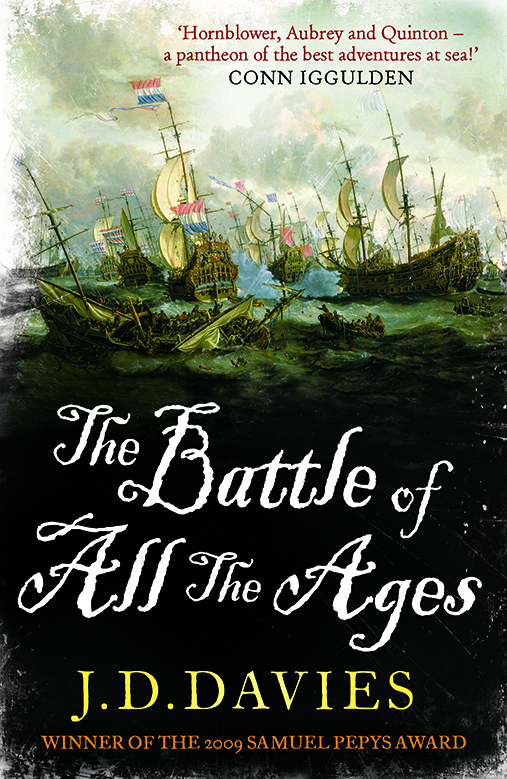 I’m delighted to be able to headline this week’s post by revealing the cover of the new Quinton novel, The Battle of All The Ages, which is number five in the series and is due to be published in the UK in June. Thanks to my publishers, Old Street, for doing such a tremendous job, and to Conn Iggulden for providing such a generous blurb. Our original contact was entirely unsolicited, as it turns out he’s a big fan of the series! The cover art is Abraham Storck’s painting of the Four Days Battle of 1666, which forms the centrepiece of the book. Storck’s painting is held at the National Maritime Museum in Greenwich, and full details of it can be found on the museum’s website. The section shown on the cover shows De Zeven Provincien, the flagship of the great Dutch admiral, Michiel Adrianszoon De Ruyter, and the Royal Prince, flagship of Admiral Sir George Ayscue. The latter is aground on the Galloper Sand and will soon surrender; Ayscue remains the only British flag-officer to surrender in battle, and the loss of the Prince caused a sense of national shock that has been compared to the loss of HMS Hood in 1941. In January 1666 France…declared war to fulfil long-avoided treaty obligations to the Dutch. The command of the British fleet for the 1666 campaign was given jointly to Prince Rupert and George Monck, Duke of Albemarle, but at the end of May they divided their fleet, with Rupert sailing off to the west to intercept a French fleet that was believed to be approaching British waters. The intelligence proved false, and on 1 June Albemarle found himself with 56 ships, facing the Dutch fleet of 86 under the brilliant Michiel De Ruyter off the North Foreland. The ‘Four Days’ Battle’ that followed was one of the great epics of the age of sail. Rupert rejoined on the third day with 25 ships, but after another day of fighting, the British fleet was forced to retire, having lost three admirals captured or killed…several thousand men, and ten ships, including the great Royal Prince. Matthew Quinton and his ship are at the heart of the action, and as well as dealing with a superior Dutch enemy, he has to contend with problems among his own crew – notably the tensions between the seamen and the newly created Marine Regiment (the precursors of the Royal Marines), and the presence of an eccentric and unpredictable character with a special connection to the King. During four days of ferocious fighting, Matthew and his friends – the likes of Lieutenant Kit Farrell, the Reverend Francis Gale and Phineas Musk – are tested to their utmost limits. In the second part of the book, Matthew is sent by the King on a dangerous mission to discover the truth about why the fleet was divided; was it treachery, incompetence or simple bad luck? In doing so, he finds himself regarded as an enemy in his own land, in a place with strong residual loyalties to the fallen Commonwealth; is forced to denounce a friend; and battles a mysterious enemy, the so-called Hell Hound. All the while, his thoughts are torn between these immediate dangers and developments far away, notably his wife’s sickness and the frantic efforts to repair the fleet so it can sail out again to gain revenge on the Dutch. The book culminates in the second great sea-battle of the summer of 1666, the St James Day fight, before Matthew finally confronts the real and unsettling truths about the division of the fleet. As usual, The Battle of All The Ages is based closely on real events, particularly during the battle scenes, and a host of real historical characters make an appearance. These include King Charles II, Prince Rupert of the Rhine, General George Monck, the famous Dutch admirals De Ruyter and Evertsen, their British counterparts Sir Christopher Myngs and Sir Robert Holmes, and the notorious Restoration rake, the Earl of Rochester. Action at sea, intrigue, Restoration poetry, and a foul-tempered monkey – what’s not to like? And if you fancy a sneak preview, the first chapter will be available on my website in the near future! Don’t think there are any plans to do the others at the moment, but I’ll see if I can nudge my publisher! Forgive my going a bit off-topic, but do you have any idea when any of your other books apart from Gentleman Captain will be available on Audible.co.uk audio book? A bit of Quinton would just suit my drive to work at the moment.